In World War II, my father served as a machinist on the flight crew of a B-17, first running combat missions out of England and then later making food and supply drops from an airfield in India. Twenty-four years after my father’s discharge, my brother went to Vietnam as a tank driver. My father rarely spoke about his time in the military, but a well-placed question could draw him out, and then he would speak of the crewmen who were his friends, and particularly the captain, an officer who did not survive the war but whom my father remembered in plain words as “a good man.” When my brother returned, he kept Vietnam to himself and endured the brutal judgments that people freely expressed about his service. These men in my life did not trust the words that civilians use to characterize war. They did not speak of courage or honor or duty. When they touched on their time as servicemen, they spoke of it mostly as work, a job, using the same words and tone of voice that they used in talking about their postwar positions, which were stations on an assembly line in a Detroit factory. I registered for the draft, but the war in Vietnam ended before I was called. I never served, but I grew up with veterans and saw the struggles that continued long after they returned. The transition from warrior to civilian seemed in some ways never ending—the desire to “stand down” often frustrated and unfulfilled. 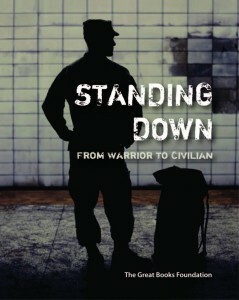 In 2013 the Great Books Foundation published Standing Down: From Warrior to Civilian, and the book soon became the anchor of a new reading and discussion program, Talking Service. In discussion groups that focus on timeless literature by writers who have a deep understanding of military service, participants reflect on their past experiences, present concerns, and future aspirations. 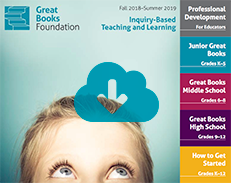 Now active across nine states, Talking Service is, for Great Books, a powerful expression of serving the common good. Indeed, all of us here feel equal measures of pride and humility in trying to serve those who have given a larger and more profound meaning to the idea of service.